Just in the last few months I have found one of my new favorite foods... SUSHI! I think part of the reason I never cared to try it was because I wasn't raised eating it. Although the transition of trying new types of sushi is slow... TL has introduced me to several different rolls. I started as a freshman in college with the CA roll, and stuck with that until about a month ago. I have gotten really into tempura, and a few of the fun rolls. Mikunis (click to see their website) is my FAVORITE sushi place to eat. They are very professional and everything there that I have tried is excellent! 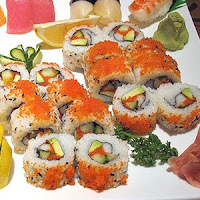 Where is your fave sushi place to eat? Any other good ones in Sac or San Francisco? mmm that place was BOMB! pretty sure it's in my top five favorite sushi places. the other 4 are in so cal though...lol no help to you! what is in the tommy roll? i think it sounds familiar! If you're ever in Piedmont there is a little hole in the wall called Drunken Fish.